Artist Robert King talks about the drawings of Native American chiefs that were made especially for Bipartisan Cafe. “These are from around 2006, maybe 2 or 3 years after Bipartisan first opened. There were Presidents on the walls, from Washington to Obama – at the time, that’s all that was on the walls. And we thought, Hey – there were leaders here before these leaders. In my mind, these were the white European leaders, and we wanted to represent the other leaders who were here in America first. The initial impulse came from the idea that we wanted to make people aware that there were other people here before us. 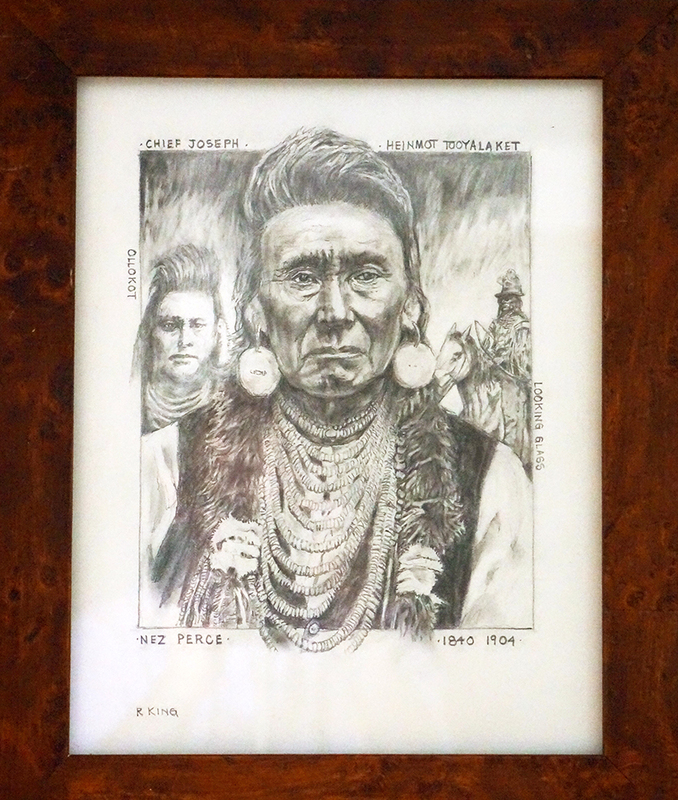 I wanted to combine drawing with text, and I wanted to depict leaders from the Plains wars up to the Nez Perce. So I chose different tribes and battles, as well as the leaders from those battles: Apache, Sioux, others. I wanted to put their actual Native American names, and not just “Chief Joseph” – names more like, Thunder Rolling Through the Mountains. “Joseph” versus that. Each of the Native Americans has their original name included in the drawing, plus information on when they were born and (supposedly) when they died, and the tribes or nations that they belonged to. “I wanted to educate people about who was here before us, and I wanted an “updated version” in order to bring in something about the current situation and not just have it be about the past. 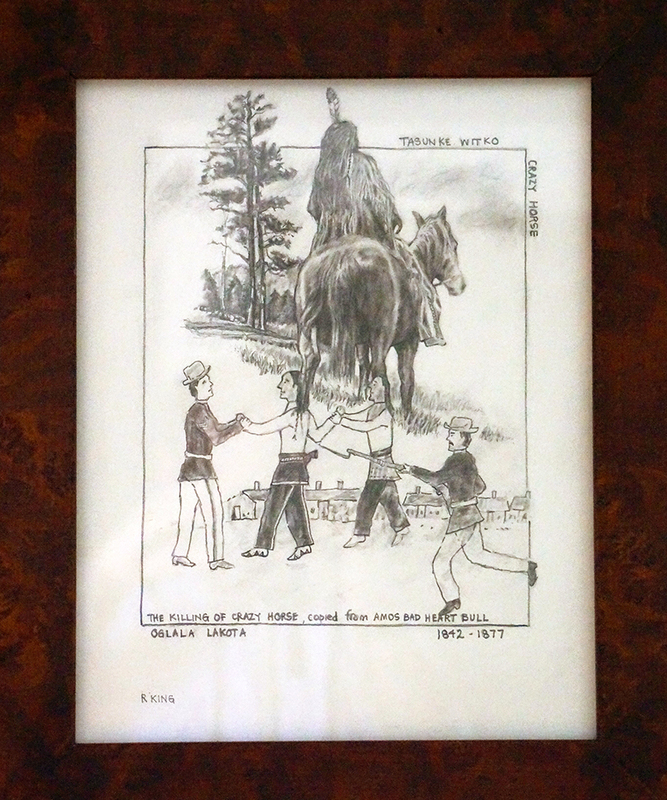 In one of the drawings, the famous battle of the Sioux is the subject, Wounded Knee. The man in the foreground survived that – Frank Fools Crow – this was a demonstration commemorating that fight and the massacre that occurred at Wounded Knee. Each of the other Native Americans depicted in the other drawings is given an explanation and a little bio, in the text piece. “Geronimo, Crazy Horse, Chief Joseph. In the drawings, I tried to respect the Native American spirit in each of them. For example, Crazy Horse never had a picture taken of him, so he appears depicted on horseback facing away, together with an image of how he was killed. “I also tried to include other warriors (with Geronimo) – two other warriors in the background. With Chief Joseph, Ollokot was his brother, depicted on the left, and Looking Glass on horseback is on the right. So those two were included because Chief Joseph was often seen as the one who was the tribe’s great military strategist – Nez Perce actually defeated the U.S. many times before the final battle. 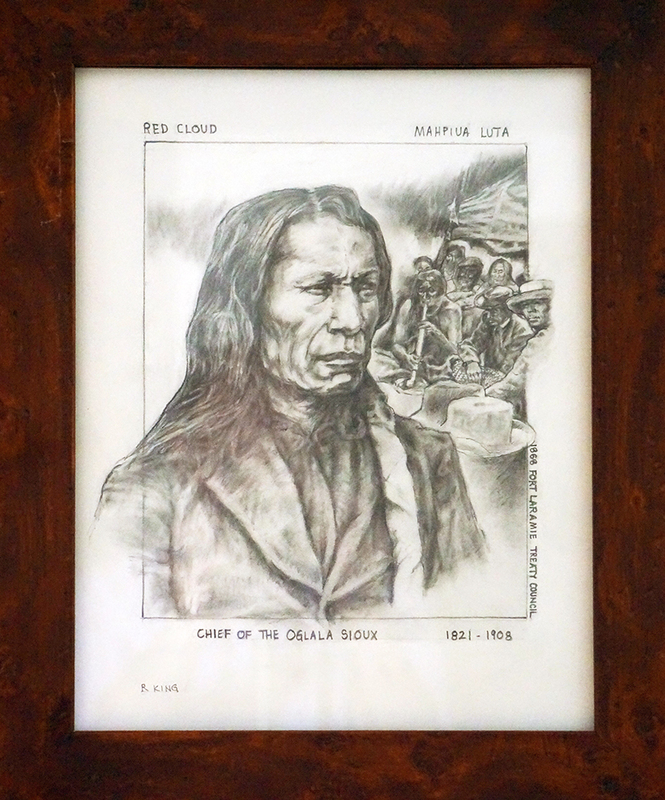 Many people don’t realize that the U.S. government actually conceded defeat to Red Cloud and signed a peace treaty with the Oglala Sioux, acknowledging defeat. The U.S. was out-maneuvered and lost many battles to the Native Americans. “When I opened the cafe, my plan was to put political memorabilia on the walls, and I wanted what I put up on the walls of the cafe to be focused on U.S. Politics and U.S. history. 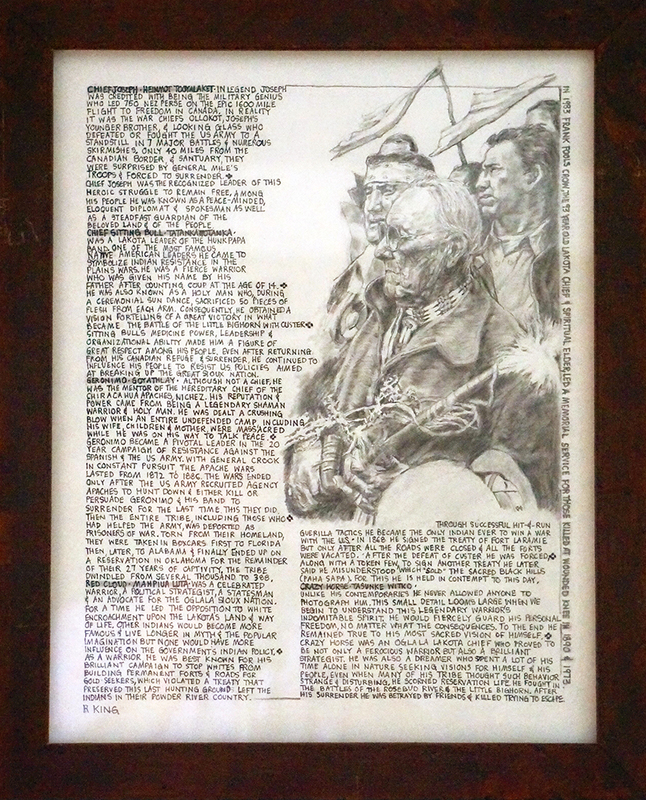 I started with just a few pieces, including the Norman Rockwell posters, a Kennedy-Johnson poster, and a few others. “At some point, I had decided to have a representation of each U.S. President. About that time, it became obvious that my walls were covered exclusively with old white men, and that there were a lot of people as well as a lot of U.S. history that was being ignored. I decided to fix this, and my first thought was of the people we displaced in order to form this nation. “I talked with artist Robert King about my idea, and he was excited by it. We spoke for some time about which people we should choose to represent, and we finally narrowed it down to the six drawings now hanging at the Cafe. 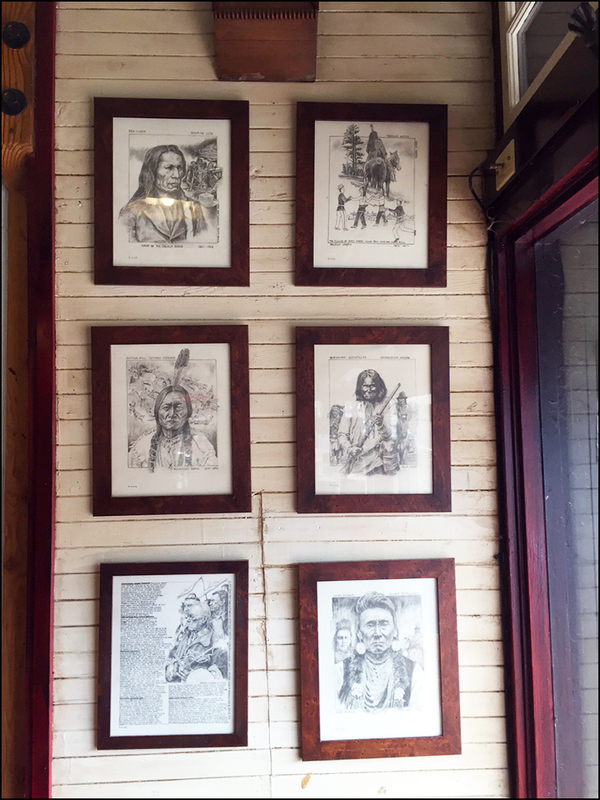 “Even though 5 of these men lived and died in the late 1800’s, I chose to put them at the beginning of the chronological representation on our walls. 5 of these men represent the final defeat of the Native American population, and I put their likenesses up with a dual purpose in mind. First, to honor the hundreds of tribes and countless millions of people who were living here when European settlers arrived. These Native Americans were people who were proud and noble. People who when you read about them today, fill me, at least, with admiration. In legend, Joseph was credited with being the military genius who led 750 Nex Perse on the epic 1600 mile flight to freedom in Canada. In reality it was the war chiefs Ollokot, Joseph’s younger brother, and Looking Glass who defeated or fought the U.S. Army to a standstill in 7 major battles & numerous skirmishes. Only 40 miles from the Canadian border & sanctuary, they were surprised by General Mile’s trips & forced to surrender. Chief Joseph was the recognized leader of this heroic struggle to remain free. Among his people he was known as a peace-minded, eloquent diplomat & spokesman as well as a steadfast guardian of the beloved land & of the people. Was a Lakota leader of the Hunkpapa Band. One of the most famous Native American leaders, he came to symbolize Indian resistance in the Plains Wars. He was a fierce warrior who was given his name by his father after counting coup at the age of 14. He was also known as a holy man who, during a ceremonial sun dance, sacrificed 50 pieces of flesh from each arm. Consequently, he obtained a vision foretelling of a great victory in what became the Battle of the Little Bighorn with Custer. 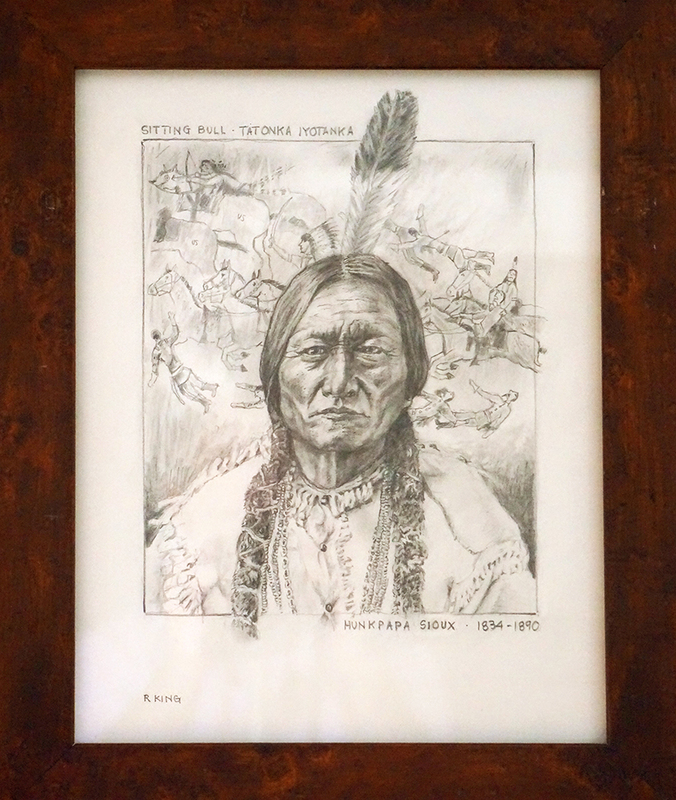 Sitting Bull’s medicine power, leadership & organizational ability made him a figure of great respect among his people. Even after returning from his Canadian refuge & surrender, he continued to influence his people to resist U.S. policies aimed at breaking up the great Sioux Nation. Although not a chief, he was the mentor of the hereditary chief of the Chiracahua Apaches, Nichez. His reputation & power came from being a legendary shaman warrior & holy man. He was dealt a crushing blow when an entire undefended camp, including his wife, children & mother, were massacred while he was on his way to talk peace. Geronimo became a pivotal leader in the 20 year campaign of resistance against the Spanish & the U.S. Army. With general Crook in constant pursuit, the Apache Wars lasted from 1872 to 1886. 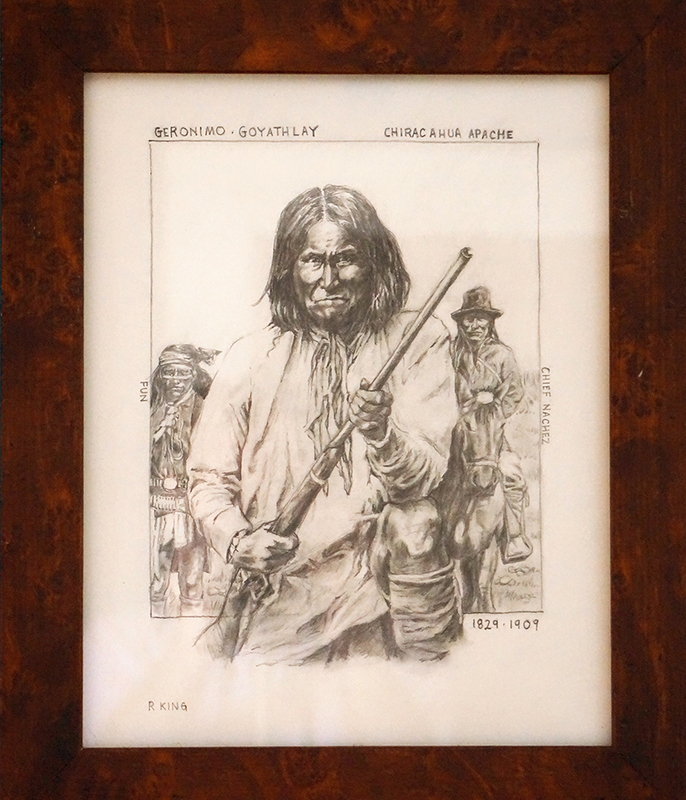 The Wars ended only after the U.S. Army recruited agency Apaches to hunt down & either kill or persuade Geronimo & his Band to surrender for the last time. This they did. Then the entire tribe, including those who had helped the Army, was deported as prisoners of war. Torn from their homeland, they were taken in boxcars first to Florida then, later, to Alabama & finally ended up on a reservation in Oklahoma for the remainder of their 27 years of their captivity. The tribe dwindled from several thousand to 388. Was a celebrated warrior, a political strategist, a statesman & an advocate for the Oglala Sioux Nation. 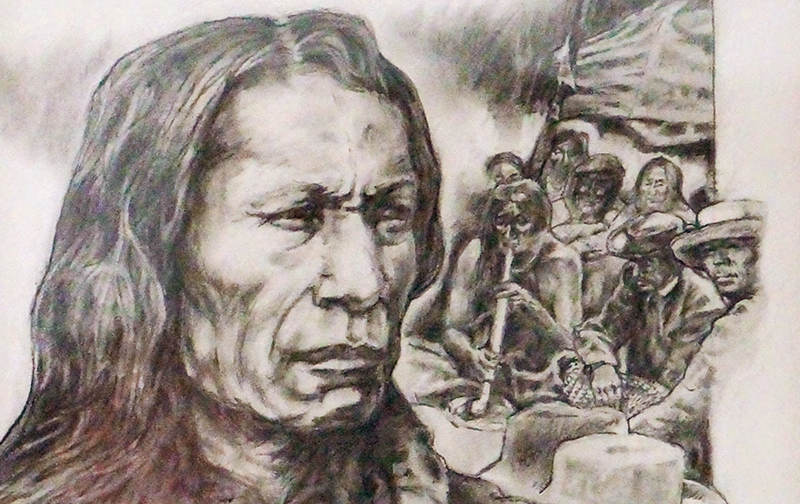 For a time he led the opposition to white encroachment upon the Lakota’s land & way of life. Other Indians would become more famous & live longer in myth & popular imagination but none would have more influence on the government’s Indian policy. As a warrior, he was best known for his brilliant campaign to stop whites from building permanent forts & roads for gold seekers, which violated a treaty that preserved this last hunting grounds left the Indians in their Powder River country. Through successful hit-&-run guerilla tactics he became the only Indian ever to win a war with the U.S. • In 1868 he signed the treaty of Fort Laramie but only after all the roads were closed & all the forts were vacated. After the defeat of Custer, he was forced, along with a token few, to sign another treaty he later said he misunderstood which “sold” the sacred Black Hills (Paha Sapa). For this he is held in contempt to this day. Unlike his contemporaries he never allowed anyone to photograph him. This small detail looms large when we begin to understand this legendary warrior’s indomitable spirit. He would fiercely guard his personal freedom, no matter what the consequences. To the end he remained true to his most sacred vision of himself. Crazy Horse was an Oglala Lakota Chief who proved to be not only a ferocious warrior but also a brilliant strategist. He was also a Dreamer who spent a lot of his time alone in nature seeking visions for himself & his people, even when many of his tribe thought such behavior strange & disturbing. He scorned reservation life. He fought in the battles of the Rosebud River & the Little Bighorn. After his surrender he was betrayed by friends & killed trying to escape. In 1983 Frank Fools Crow, the 93 year old Lakota Chief & spiritual elder, let a memorial service for those killed at Wounded Knee in 1890 and 1973.